Ladies, this is something that I have wanted to do for a looooong time: a series of starter kits especially for you! I’ve begun with the classic colours we all need in our wardrobes: black, grey and white. Staple colours and great basics. The starter kit has everything to get you kitted out quickly: a shape, skins (the full set of Eloh ones), hair, shoes, tops, pants, dresses, underwear, a walk override, radar HUD, flight feather, posing stand, helpful notecards, and landmarks (contained in one of the notecards). Hasty, hasty. Little did I even think that in order to keep my XStreet box rezzed, I of course needed some land somewhere. So I guess I’ll have to keep on paying rent after all. It’s not that much, really; just a pain when I’m not able to get in-world very much at the moment. Anyhow, I have managed to get in-world today, and I’ve made two nifty items that are now on sale in my store in Baileya, and also at my XStreet store. The first – the Quicksit Mover-Upper – is my superfast way of getting high in the sky without flight assist. I thought to build this for sale (and cheaply, too!) because since I’d deleted my sky house, I needed to get back up there to re-rez it today. The Mover-Upper has been my way of getting to 500m or 800m (or however high I want to) for some time now. The other – the Changing Skybox – operates on the same principle, but it’s a 10mx10m enclosed room with a drop-through roof (flexible prim, very handy for making things phantom without making everything phantom!) and a simple posing stand that, once stood on, will allow you to edit the skybox and yourself up to any height, as with the Mover-Upper. The Changing Skybox also has transparent local lights, to give you a full and clear view while you’re unpacking boxes, trying on items and editing them. Hop behind the cut for the ad boards. Sadly, my time in-world is so limited right now that paying rent to live in SL is pointless when I’m not actually there. To that end, I won’t be re-renting my home parcel after this weekend. This also means the little stall in Baileya that I’ve been selling my few things at will have to close since it was a free offer as part of my rental deal. The stall will remain open until the weekend, after which time you’ll only be able to obtain my items via Xstreet. I shall miss my little home, but until such time as I can get back in-world on a more regular basis, I shall be joining the Hobos of Second Life. So, at my little stall in Baileya, and also on my page on XStreet (which is SL Exchange’s new name) you can find the first of my favourite books in notecarded form: Little Women by Louisa May Alcott. What you’ll get for your 0L$ is a folder containing the cover and a single notecard. Embedded in the notecard are all the book chapters. I’ve also embedded the next chapter along into the bottom of each individual chapter notecard, so you don’t have to keep clicking back and forth from the index card if you’re reading continuously. OK, itty-bitty market stall, sweet itty-bitty market stall, but hey… we’ve all gotta start somewhere! I’ve set out my teensy collection of things in the Baileya Market, which was a part of my rental deal for Mar’s home. I’m still waiting for the rental box to be removed (the owner told me to just set out my prims and the box would be removed) but I can has sales presence? Why yes, I can! The area’s not that great, to be honest: low traffic, and a lot of people on the ban list, so I suspect it gets a few griefers, but since it’s at Coney Island of the Mind, and is full of funfair-type stuff, I guess that’s to be expected. Hopefully soon I can rent a small store in a better area, but while I have so few thing to sell, a big store just isn’t worth it! To get to the stall, you’ll probably have to take the TP twice (yes, it’s one of those areas that sets you down at a landing point). Either that, or follow the red beam, or… when you land, head North toward the boardwalk, keeping the wooden pier on your left. 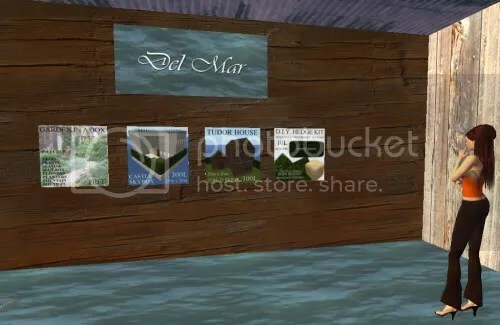 Once on the boardwalk, immediately turn right, and Del Mar is the second stall on the ground floor on your left, between the voting machine and the ‘new listings at Ravenglass’ sign.